This four bedroom detached property is situated in a quiet residential area within Bingham. The property sits on one of the larger plots within the locality and therefore offers great potential should anyone wish to extend the property (subject to relevant permissions being granted). With neutral decor throughout, this property comprises, entrance hall, wc, lounge, kitchen, dining room, conservatory to the ground floor. To the first floor there are four bedrooms and the family bathroom. 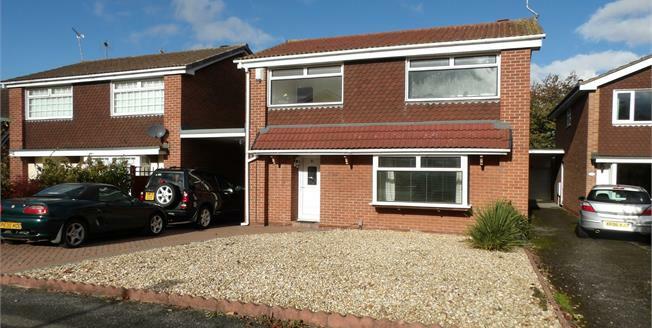 To the exterior, there is parking for several cars to the driveway which leads to a detached brick built garage, the front garden is laid to gravel. To the rear, there is a delightful garden, which has a patio, lawn and mature trees and shrubs. This property is ideal for any growing family and we strongly recommend an early viewing to avoid disappointment. Access if via a covered porch where this is an external feature light, entry is through a UPVC door to the entrance hall which comprises, double glazed window to side elevation, double radiator, laminate floor under stairs storage, doors leading to various rooms and stairs leading to first floor. Double glazed window to front elevation, pedestal wash hand basin, low level wc, radiator. Double glazed bay window to front elevation, double radiator, tv point. Double glazed French door leading to conservatory, double glazed door to conservatory, laminate floor, double radiator, glazed unit to the lounge. Of UPVC and double glazed construction, with tiled floor and double doors to the garden. Cupboard housing water tank, loft access. A good size double bedroom with double glazed window to front elevation, fitted slide robe wardrobe, built in storage, radiator. Double glazed window to front elevation, fitted slide robe wardrobe, radiator. Double glazed window to rear elevation, radiator, built in storage cupboard. White suite comprising, walk in shower cubicle with wall mounted shower and tiled walls, panelled bath with mixer tap shower over, pedestal wash hand basin, low level wc, double glazed window to rear elevation. To the front of the property, the garden has been laid to shingle, there is a driveway for several cars leading to a detached brick built garage. To the rear, the enclosed garden has a patio area, lawn, mature trees and shrubs.